Before the first train reached Asheville, North Carolina in 1880, travel throughout the region was by wagon, horse, or coach. The time honored art of walking remained a fact of life in many communities. The first of three geographically based timelines, Following Wagon Trails focuses on late 19th century life in western North Carolina. 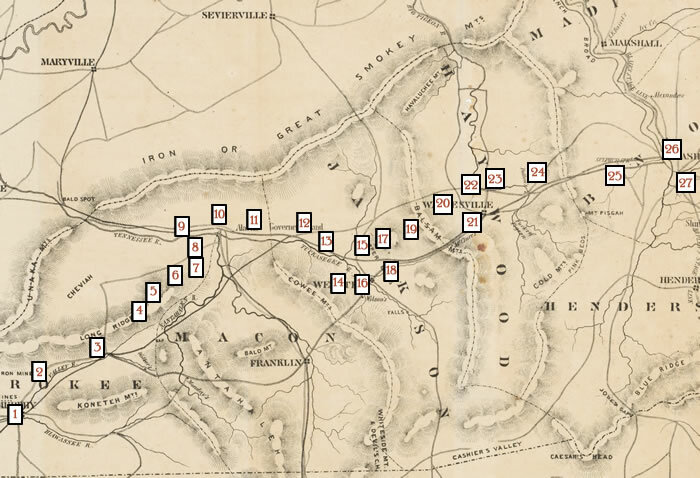 The “trails” stop at 27 different communities that are described from contemporaneous accounts of life and travel in the 1880s and 1890s. Each stop also provides historical commentary on the illustrations. Want to travel more? Take the train in the 1910s or Motor though the mountains in the 1930s. A note on the spelling of place names – Several of the place names used in the text of this site have variant spellings. For instance, historical sources may spell the Tuckasegee River as Tuckaseigee, Tuckaseige, or Tuckaseegee, or as in the example where a community is rendered both as Hewitt and Hewitts. As the historical quotations have been rendered verbatim, these variant spellings have been left intact in quotations and are not typographical errors. The place names used on this map are from the 1912 travel guide The Western North Carolina Section at a Glance (Issued by the Passenger Traffic Department, Southern Railway, Premier Carrier of the South, Washington, D.C., 1912). This usage is meant to make it possible to follow the development of western North Carolina through different time periods by keeping the place names consistent, even though in some instances place names may have changed between the 1890s and the 1910s. Also, some of place names may be associated with a larger geographic region. For instance, the rail stop for Regal, N.C., also includes the communities of Tomotla and Marble.